In March 1960, an elegant if somewhat fragile actress in her mid-40s boarded a PanAm flight from London to New York. Dressed in a form-fitting suit, her face masked by an overlarge pair of sunglasses as if she hoped they might afford her a modicum of privacy, she slipped into her first-class seat and readied herself for the hours-long journey. Under normal circumstances, she would have relished the trip. She was about to go on tour with a bona fide hit, her first in several years, a production of the Jean Giraudoux melodrama Duel of Angels. She had performed the play to great acclaim in London's West End and now was taking it to Broadway, where she would go face-to-face onstage with Mary Ure, one of the most gifted actresses of her generation and among the few who could match her, fire with fire, ice with ice. But this time was different. Unknown to all except her most intimate circle, Vivien Leighwas on the edge of a precipice, her personal life teetering even as her professional life once again was taking off. A quarter-century since she had first glimpsed Laurence Olivier, when she was just 20 years old and he six years older, their marriage was on the brink of collapse. Over the past year or more, the actor, widely considered the greatest stage performer of his generation, had grown remote and indeed had barely seen his wife as he shuttled from one theatrical watering hole to another with the play that had revitalized his career, The Entertainer. His absence was unavoidable, he told Leigh — a professional obligation, an irritation, nothing else. But privately, she harbored doubts. There must be another woman, she thought, and the idea nagged at her and gnawed at her until she couldn't let it go. Within days of her arrival in New York — and hours before her play was to open — she received a cable confirming everything she dreaded: that Olivier was in love with someone else and wanted a divorce. The news shattered her. She fell into a depression, exacerbating an already unstable mental state and quickly leading her to agonizing sessions of electroshock therapy, even as she somehow found the strength to continue onstage. A relationship that had been the talk of the town — indeed, the world — was over. "I don't believe she ever recovered from the impact of the telegram," said one of her friends. (Original Caption) 10/2/1953-Manchester, England: Actress Vivien Leigh matches her own beauty with that of the flowers surrounding her in her dressing room at the Opera House in Manchester following the premiere of 'The Sleeping Prince.' The wife of Sir Laurence Olivier said she never felt better- the performance marked her return to the stage following an illness that forced her to leave Hollywood last March. (Original Caption) 'Scarlett O'Hara' Chats With Friend In Atlanta. Atlanta, Georgia: Vivien Leigh, Scarlett O'Hara in the film version of Gone with the wind, chatting with Laurence Oliver, star of Wuthering Heights who is reported to be Miss Leigh's fiance. The couple are in Atlanta for the premiere of Gone with the Wind. Vivien Leigh and Laurence Olivier in a publicity photo in 1939. They would be married the next year. Fifty years since the actress' premature death from tuberculosis at the age of 53 on July 8, 1967 — thanks to an extraordinary trove of some 10,000 documents obtained by London's Victoria and Albert Museum in 2013 but only recently cataloged and made available to the public — it's possible to see Leigh and her relationship with Olivier in a new light. From the onset of their affair in 1936, one can track the turbulent course of their romance, from the scalding heat of their first years together through their greatest work (Gone With the Wind and A Streetcar Named Desire in Leigh's case; Rebecca and Henry V, among many others, in Olivier's) and on to the tragic end of their marriage in the early 1960s. Purchased from the Vivien Leigh estate, the archive complements a collection of the star's belongings that were auctioned by Sotheby's on Sept. 26, largely comprising photos, furniture and personal items but not her private correspondence. The V&A materials, to which THR was granted access, include her diary, extensive scrapbooks, photographs and stereoscopic slides, alongside correspondence with the likes of Winston Churchill, T.S. Eliot and Marilyn Monroe. The archive also features a note from Queen Elizabeth II, apologizing for being rude and thanking Leigh for "the perfectly lovely flowers." Among its highlights are letters from Elia Kazan, the director of 1951's Streetcar, promising that he would make no substantive changes to the original Tennessee Williams play, which Leigh had performed in the West End. "I tried to get Tenn to do a new sixth scene, and ...; I have just thrown it out and he is piqued with me," reveals Kazan. "The fact is, what Tenn first wrote was a lot fruitier than what you read. There was a 'mad' run down crumbling stairs." Above all, the archive features some 200 letters from Olivier, several 20 pages long, mostly dating from the beginning of the couple's affair — when both were married to others and terrified that their clandestine involvement would kill their Hollywood careers — but some from much later. "O my darling little love I do long for you so," writes Olivier, characteristically. "Oh my hearts blood it is unbearable without you." "Leigh was a highly organized individual and often praised her strict Roman Catholic upbringing in London for giving her day order and routine," says the V&A's Keith Lodwick, who notes that her own letters to Olivier are not in the archive. It's unclear who has them. Vivian Hartley (her birth name, with its original spelling) was born in 1913 in Darjeeling, India, at the height of the British Raj, the daughter of a British emigre who had become a successful stockbroker and defied the mores of his expatriate community by marrying the sister of a local chauffeur. Whatever stability marked the girl's early years was destroyed when her parents took her on a voyage to London and placed her in a Catholic boarding school of Victorian austerity. She was only 6 years old and would not see her mother again for nearly two years. Fourteen years later, having left the school and embarked on a career as an actress, she glimpsed Olivier in the 1934 stage comedy Theatre Royal. He was brilliant and charismatic, and she fell instantly in love. This was the man she was going to marry, she told a friend, despite the fact she already was married, with a child, and so was he. The Oliviers' affair would not get underway until both were cast in the 1937 movie Fire Over England. 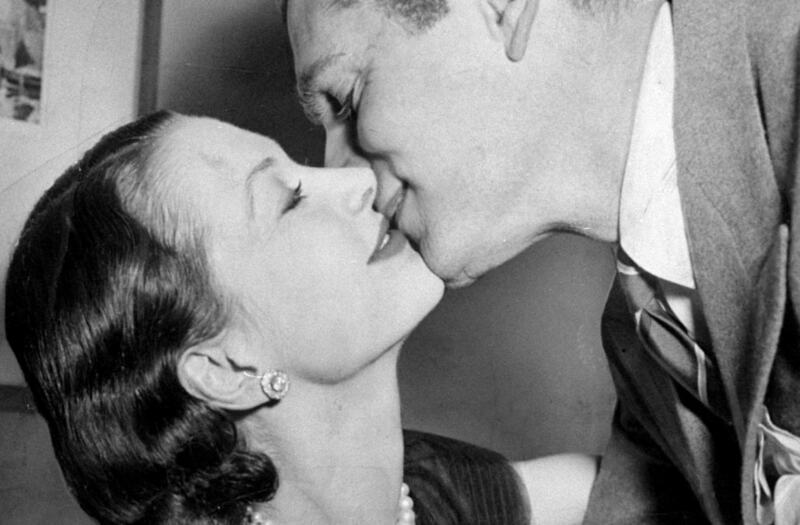 Abandoning their spouses, they plunged into their romance, even as Hollywood moguls looked on, appalled at the thought of a scandal, especially after Olivier was cast in 1939's Wuthering Heights and Leigh in that year's Gone With the Wind. When Olivier, in Los Angeles, tries to arrange a tryst with Leigh, Wuthering director William Wyler reprimands him, and Olivier seethes. "I really am in hell my love — the valley of the shadow," he writes her in England. "I've never felt quite such a grim feeling." When Leigh moves to L.A. for Gone With the Wind, Olivier leaves for a Broadway commitment. The actress is in turmoil during the shoot, above all when George Cukor is fired as director and replaced by Victor Fleming. "Don't worry about Fleming at all," writes Olivier. "I'm sure that no one can teach you anything about Scarlett, and tho' you may miss George's actual direction + his talking things out I'm sure that the fact of your tests being so much better than your first few days of performance shows that no-one [can] add much of any great value." Perusing these letters in the V&A reading room, it's startling to discover that both Leigh and Olivier are convinced GWTW will be a disaster, and start planning how the actress can salvage her career. "You have got to justify yourself in the next two or 3 films (or even 2 or 3 years) by proving that the presumable failure of Gone W.T.W. was not your fault and you can only do that by being really good in the following parts," writes Olivier. "To make a success of your career in pictures [is] ESSENTIAL for your self respect, and our ultimate happiness therefore. ...; If you don't, I am afraid you may become just — well boring." Leigh was anything but boring, as Olivier would discover when she exhibited increasing signs of mental illness. He first senses something is wrong in June 1937, when she accompanies him to Denmark for a theatrical production of Hamlet. There, she attacks him verbally but is unable to recall the incident the following day. Two years later, during the GWTW shoot, her Hollywood secretary, Sunny Lash, sounds an alarm in a previously unpublished letter to Olivier. "Several times I thought she really was going mad," she says. "She warned me once that someday she would and I was beginning to believe that time had come." When Olivier takes Leigh to a psychiatrist, she stages a performance so effective that even the therapist is convinced she's all right, though her condition continues to deteriorate. Eventually she is diagnosed as manic-depressive. In these days before lithium, with no cure or medication, Leigh's behavior grows ever more erratic and her friends become ever less understanding. At one point, she is found wandering naked in the public gardens outside the couple's London apartment; at another, she falls into bed with a near-stranger and then begins an affair with the Oliviers' protege, Peter Finch. During her highs, she is a whirlwind of energy; during her lows, she suffers from terrible depressions. All of this exhausts Olivier, who often is forced to get by on three or four hours of sleep while dealing with her mania — even as he does some of his best work onstage and Leigh somehow finds the courage to appear alongside him and in other productions. Nothing in their story is quite as horrifying as Leigh's breakdown during the 1953 shoot of Elephant Walk in Sri Lanka, where her out-of-control behavior prompts the producers to call Olivier to the rescue. He flies out at once but is unable to help. Afterward, when the cast and crew relocate to Los Angeles, Leigh veers from shivering fits to foulmouthed tirades. Two friends, David Niven and Stewart Granger, are summoned to calm her but fail, and Niven has to pin her down while a nurse injects her with a tranquilizer. Inevitably, she is fired from the movie (replaced by Elizabeth Taylor) and sent home to London, where even her closest friends blame her for conduct unbecoming — as if she has any ability to control her illness. Olivier, whom critics have savaged for putting his career over his wife, emerges as far more caring in the V&A letters, particularly when Leigh has a bout with tuberculosis. "Please please my angel send me word of what the doctor said, + if it is possible ask him to send me a report," he writes from Paris. "You're the only person in the world who could make hideously selfish me love another more than I do myself." Throughout, he stands by her, until he can stand by her no more. Twenty years into their marriage, feeling trapped — not just by Leigh but by the glamorous image the couple has cultivated — he realizes everything must change if he wants to reach new artistic heights. Turning his back on the trappings of the West End, he throws himself into a new play at the avant-garde Royal Court Theatre, for which he's paid the grand sum of 50 pounds ($75) a week. The success of The Entertainer and his role as a failed vaudevillian — who lacks Olivier's own most essential quality, talent — will propel him to a brilliant last act, even as he jettisons Leigh for actress Joan Plowright, who becomes his third wife. When Leigh receives that awful telegram in New York, she fights to win him back. But it's too late. The couple's intense passion has burned itself out, their intimacy has long ago disappeared. In 1960, they agree to divorce. Leigh will not survive much longer. In 1967, living with actor Jack Merivale but always cherishing the photo of her ex-husband that she keeps in her bedside table, she succumbs to tuberculosis. Olivier will never lose the profound guilt he feels for abandoning his wife, which will haunt him until his own death in 1989. In the archive, the most touching of all his letters is the one in which he confesses his remorse. "Oh God Vivling," he writes, shortly after their parting of the ways, "how I do pray that you will find happiness and contentment now[.] I pray constantly that I may take off from you some of your unhappiness onto myself and I must say it seems to work from this end as your unhappiness is a torment to me; and the thought of it a constant nightmare. Perhaps perhaps now it may be allowed to gently lift off and blow softly away."